Dave Freeman was born in Marylebone, London on 22nd August 1922. He trained as an electrician before joining the Royal Naval Fleet Air Arm at the outbreak of the Second World War. His service with the Pacific fleet took him to Ceylon, India, South Africa, Kenya and finally Australia where he met and married his wife, Alberta. 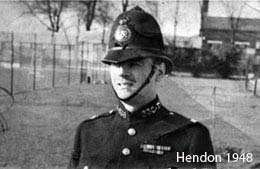 Upon return to England in 1946, he joined the Metropolitan Police as a police constable in Paddington rising to a Special Branch detective at Scotland Yard. He was called up by the Navy again in 1951 for the Korean War but this time as a Petty Officer, he never sailed out of Portsmouth. After a period back at Special Branch, he became a journalist, then took a job as a security officer for the American Officers' Club in Regent's Park, London. One of his tasks was to book entertainment acts and when he struck up a friendship with Benny Hill, the pair started writing together. During the small screen's so-called Golden Age, he wrote scripts for comedians including Benny Hill, Ted Ray, Terry Scott, Spike Milligan, Eric Sykes, Charlie Drake, Arthur Askey, Leslie Crowther, Roy Hudd, Jimmy Edwards, Tommy Cooper, Harry Worth and Frankie Howerd. Although Benny Hill eventually wrote all of his own material after moving to ITV in 1969, Freeman co- scripted sketches with him for The Benny Hill Show on BBC - screened on and off between 1955 and 1968. The early series were notable for spoofs of popular television personalities of the time, such as the quiz- and talent-show host Hughie Green, the globe-trotting journalist Alan Whicker, and the undersea explorers Hans and Lotte Hass. 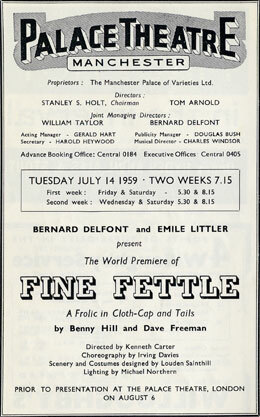 Freeman was teamed with Hill for the second series in 1956, and also appeared on screen when the star made one-off shows for ITV (1957-60) under a special contract with Bernard Delfont. He was later responsible for most of the scripts when Hill starred in three series of a BBC sitcom titled simply Benny Hill (1962-63), featuring the comedian in a different role each week in self-contained playlets. By then, Freeman's contribution to the partnership had been acknowledged with Hill's insistence on using him as writer in a series of television commercials for the soft-drinks company Schweppes. Hill was approached with the offer while appearing in the West End stage revue Fine Fettle (Palace Theatre, 1959), another of the duo's collaborations, and they made more than 50 adverts over five years. Freeman created a string of characters, including a gardener, a shopper, an astronomer and a burglar, and one of the commercials became the first from Britain to win the Grand Prix de la Télévision at the Cannes International Festival of Publicity Films, in 1961, beating more than 500 entries from 21 countries. While Freeman was part of Associated London Scripts he also teamed up with John Junkin and Terry Nation to write episodes of a radio series for Elsie and Doris Waters, whose much-loved characters, Gert and Daisy, were uprooted from the East End of London to a village stores in the picturesque village of Russett Green in Floggit's (1956). But television became Freeman's medium. Alongside his success with Benny Hill, he contributed to sketch-based programmes such as The Ted Ray Show (1955-59), and Great Scott - It's Maynard (starring the comedy duo Terry Scott and Bill Maynard, (1955-56). Switching channels briefly, Freeman, Junkin and Nation joined Spike Milligan in scripting The Idiot Weekly, Price 2d (1956) for ITV, the first successful attempt to transform the comedy of The Goon Show from radio to television, although it was screened only in the London region. Moving back and forth between the BBC and commercial channels, Freeman wrote the sitcoms Charlie Drake in . . . (co-scripted with Drake, who played a different character each week, 1958-59) and both Arthur's Treasured Volumes (1960) and The Arthur Askey Show (1961) for the diminutive Liverpool comedian. He also created and wrote sitcoms for Roy Kinnear and Jimmy Edwards. In A World of His Own (1964-65), Kinnear played the daydreaming Stanley Blake, an outwardly ordinary husband lost in his own fantasies. The Fossett Saga (1969) was a spoof on The Forsyte Saga and starred Edwards as an author of penny-dreadfuls, bon viveur and patron of the arts in Victorian London. Freeman also wrote the fantasy serial Knock Three Times (1968), starring Hattie Jacques and based on the children's book by Marion St John Webb. Much of his subsequent career was spent contributing episodes to some of television's most popular sitcoms, including Bless This House (1971-76), Robin's Nest (1977-81) and Keep It in the Family, writing nine episodes with his son, the playwright Greg Freeman, between 1980 and 1983. He wrote, too, for Terry and June (1979-87), which starred Terry Scott and June Whitfield as husband and wife, a pairing that had begun on the sketch show Scott On . . 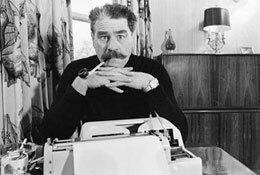 ., for which Freeman wrote the entire third and fourth series in 1970-71. The two also appeared in Freeman's stage farce A Bedfull of Foreigners, which ran in the West End for 18 months in 1973-74 and has since been performed all over the world. Freeman also co-wrote two other plays, Key for Two with John Chapman and Kindly Keep it Covered with Greg Freeman. After contributing to Carry On television specials Freeman wrote the feature film Carry On Behind and later Carry On Columbus. He also wrote the film scripts for Bless this House and Rocket to the Moon. 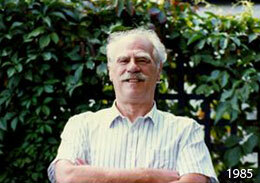 Dave Freeman died five months after his wife Alberta, in March 2005, leaving three children and ten grandchildren.